I was pretty jazzed to see Cymande’s “Bra” featured on the music insider website Idolator this afternoon, as their wayback machine posts are by far my favorite feature. Heavily sampled over the years, “Bra” thankfully retains it’s original badassness. Yes, it’s badassness. 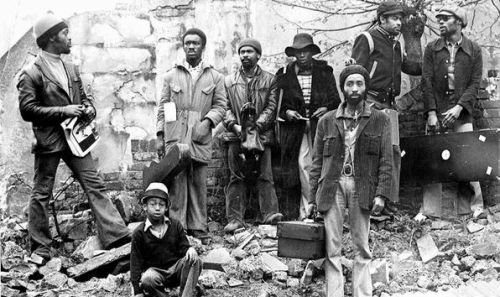 Cymande, the short-lived West Indies/Jamaican, eight person, outfit was pretty versatile, as exemplified by the track “Dove” below. Unlike the slinky funk on “Bra,” “Dove” almost sounds like a long lost early seventies Santana outtake. “Dove” and “Bra” can both be found on the remastered Renegades of Funk collection. Check it out. I’ve been singing Cymande’s praises for some time now…any time someone asks me for new music, those dudes are the first band I recommend. Good spot, man. Great couple of posts, man. I dig, I dig. The track was also on the Scrapple soundtrack which you previously highlighted. Fun movie with a great soundtrack. this track was sampled on a song called “skyscraper” by kinobe.